As a self-confessed skincare lover, I was very excited when I was given the opportunity to trial some skincare products from a Danish brand called Urtekram. Founded in 1972, Urtekram are well-known for creating plant-based products that are wholesome and natural. Their product range is also recognised by the Danish Asthma-Allergy Association and certified for use by those suffering with allergies, thus making them suitable even for those with the most sensitive of skin. Urtekram recently launched a new range with 59 hair, body and oral care products, all of which are hypoallergenic, Vegan Society approved and free from parabens, synthetic ingredients and artificial colours. The range includes shampoos and conditioners, body lotions, hand creams, shower gels, soaps and scrubs, crystal deodorants and toothpastes. I was sent three products: Aloe Vera shampoo, All Over Wash (non-fragranced) and Hand Soap (non-fragranced). I have been using these for a few weeks now and here is what I thought. A gentle shampoo which works well for sensitive scalp. The product is said to have the scent of sun-ripened oranges but I could discern a very natural and mild herbal scent which I was unable to identify. It is a fresh and non-synthetic scent which I like. While the shampoo does not lather much, it does a fantastic job; leaving hair clean, soft and feeling moisturised. This one is a very gentle wash that can be used for both hair and body. It is meant for babies so is very gentle, doesn't sting the eyes and has no perfume. You only need a little for each use and it contains aloe vera and glycerine to nurture the soft skin of babies. But it is equally excellent for those with sensitive skin or those who are allergic to fragrances. Another non-fragranced product, the hand soap leaves hands clean and soft with zero fragrance. It comes in an easy to use pump action dispenser and makes use of aloe vera and glycerine to create soft bubbles, leaving hands clean and soft. Overall, I thoroughly enjoyed trying out all the three Urtekram products. They are gentle on the skin, certified organic and vegan. Urtekram skin and beauty products are available from all good health food shops. For more information about the Urtekram range you can visit www.urtekram.com or www.healthyfoodbrands.co.uk. 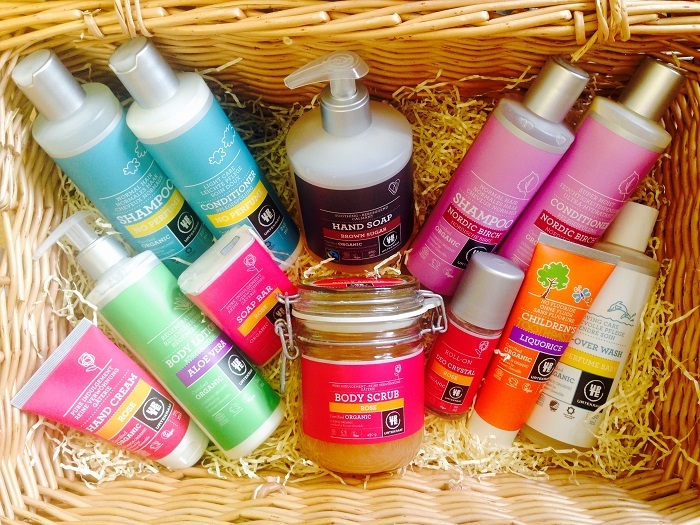 Fancy winning some Urtekram beauty products to try out yourself? Well, here is your chance. The lovely team at Urtekram are giving away a hamper full of their best-selling products to one lucky reader of the blog. All you've to do is complete the entry options listed in the Gleam widget. The more entry options you complete, the more your chances of winning. All the best! I have been given organic products occasionally and really liked the idea of not putting nasties on my skin. I'd love to try the Rose Crystal Deodorant. I haven't tried your products however Its the body scrub i am keen to try, i find it hard to find a good scrub! Great prize, thank you for the chance.I love organic products, I didn't tried your organic products, but I have tried other because my skin is so sensitive. I like Rose Himalaya Salt Body Scrub from the hamper. I have t tried any of this range before but I love the look and sound of the brown sugar hand soap. I have tried a few organic skincare things, they're usually lovely scents. I like the sound of the brown sugar hand soap, I bet it smells nice. Yes I have tried organic products before. The Rise Crystal deodorant and Rose Body Scrub interest me. I love the scent of roses. Would love to try these..
Oh there's so many lovely things. I love a good body scrub so would be keen to try that. I run a cruelty-free free blog and many ethical products are organic too so I'm an avid organic fan. I haven't tried organic body products before but I'd love to try the Rose Crystal Deodorant as I've heard good things about crystal deodorants. The Rose Himalaya Salt Body Scrub really interests me as I love body scrubs! Haven't used before so have an interest in them all, particularly the Brown Sugar Hand Soap. i havent tried any, the hand wash would b v useful! I love organic products. The No Perfume Shampoo really interests me as I think it would be perfect for my poor hair! I have never tried organic products. I like the sound of the Rose Himalaya Salt Body Scrub. I like the sound of the Rose Himalayan Salt Body scrub too. I love rose scented things, and also love textured scrubs. Not sure it really has to be Himalayan salt though. No I haven't but I would like to try the Rose Crystal Deodorant. I have not tried but I would love to try the no perfume baby wash...I have very sensitive skin and it sound s fab! I love using organic products.The brown sugar hand soap sounds interesting. Wow, this looks incredible - thanks for the giveaway and best of luck to everyone! Yes, I've tried a few. They all look great. I would like to try the aloe vera body lotion! I haven't tried any of these of products yet and I'm especially interested in the Rose Himalaya Salt Body Scrub. Not yet but the Rose Himalaya Salt Body Scrub sounds interesting! I have not tried any of these before, I would really love to try the body scrub - I love to have a good bath and soak and then use a good scrub on my skin, it always makes it feel so soft afterwards. I haven't, but this hamper sounds fantastic and would be great to share with family. Love the sound of the brown sugar hand soap! Brown Sugar Hand Soap sounds fantastic! I'd love to try it! I try to stick to natural and organic products as much as possible. I'd like to try the organic deodorant. I've tried various organic body care products before. I'd love to try the Rose Himalaya Salt Body Scrub, because I use a similar one from Molton Brown so would be interested to see what this one's like. I've not used any...it's the rose hand cream that appeals the most! i haven't tried them but they look fab! Rose Himalaya Salt Body Scrub sounds great. A few in the past, but not regularly. I like the sound of the liquorice toothpaste for kids! The Nordic Birch Shampoo is one I'd definitely like to try. I have used other organic products before but not stuck with any of them. I've only ever tried things here and there but nothing long term because I could never find anything in my local shops! The Brown Sugar Hand Soap would interest me because I love sugar scrubs so I would love to try it! I have not tried any yet however I am looking for a new skin care routine so I would love to try these out! Sorry i haven't tried any yet, but i bought some for my daughter last year and she loves your products. I would love to try the body scrub - I love how soft your skin feels after using it! I've not tried them before but the brown sugar hand scrub sounds lovely and the rose quartz deodorant sounds interesting too. I haven't tried organic beauty products before but three brown sugar soap sounds good. No I haven't tried any before, I am interested to try the salt scrub! ive never tried them but Rose Himalaya Salt Body Scrub looks fab. No, I have never tried them before. The rose crystal deodorant sounds lovely. The brown sugar hand soap sounds really interesting, I haven't tried any before. I haven't but the Rose Himalaya Salt Body Scrub sounds divine. I haven't tried organic products before - the Aloe Vera Body Lotion sounds good. I often use organic products from Green People & Faith in Nature - I'd love to try the shampoo & conditioner from this set! I've never tried organic products, they sound great though. The product that interests me the most is the Brown Sugar Hand Soap - it sounds intriguing! We haven't but we'd love to try them! I do use some organic products - I particularly like the sound of the Rose Crystal Deodorant. I think I've tried some organic products, but it's not something I actively search out. I would like to give the deodorant a try. I haven't, but I would love to! They all look and sound fab. I love the sound of the Rose Himalaya Salt Body Scrub. Would love to try the Rose Himalaya Salt Body Scrub. I've tried quite a few organic skin products. I'd like to try the shampoo. I love organic products as I have sensitive skin. I love the sound of the brown sugar soap, I bet it smells divine! I have not tried, but would love to. Not tried them before but would love to try the conditioners as I am always eager to find ones to help calm my hair down a bit. Brown Sugar Hand Soap sounds great! I want to feel it! I haven't tried these products before but they look appealing! I prefer to use organic products!The body scrub looks lovely! I use a lot, I think it's really important especially for children! I'd like to try out the childrens toothpaste. I haven't tried many, just a few I've picked up over the years so would love to try more. The rose products particularly appeal, especially the crystal deodorant. Never tried these products before but looking forward to trying them all. I would love to try the nordic birch shampoo/conditioner. sounds amazing! No I have not tried any of the products but I would love to try the sugar scrub and the hand cream.